Similar in its appearance to the UK Pilot or Civil Jack, this is a Union flag surrounded by a white border and emblazoned with the St. Edwards crown under which the letters Q.H.M. are inscribed. A flag for this purpose was first formally proposed on 28 May 1914 (with the proposal being amended on that same day), approved on 19 June 1914 and (in its original form - with a Tudor Crown and the initials KHM) was introduced in Notice to Mariners 489 and Admiralty Weekly Orders 916 of 27 May and 9 June 1915 respectively. The lettering was amended and the crown changed (along with the crown on other British flags) following the Accession of H.M. The Queen in 1953. It should be noted, however, that whilst the construction details given here are based on the current (2004) Edition of BR20 - Flags of All Nations - published by the Ministry of Defence, the style of lettering and size of the disk very probably date from Change No. 5 (the 1999 revisions) to the previous Edition? Similar in its appearance to the UK Pilot or Civil Jack, this is a Union flag surrounded by a white border and emblazoned with the Tudor crown under which the letters K.H.M. are inscribed. A flag for this purpose was first formally proposed on 28 May 1914 (with the proposal being amended on that same day), approved on 19 June 1914 and was introduced in Notice to Mariners 489 and Admiralty Weekly Orders 916 of 27 May and 9 June 1915 respectively. The construction details given here are based on information collected by the German Foreign Ministry and published in the 1939 Edition of the German Admiralty Flag Book - the Flaggenbuch. Just to add a little extra from the extensive copies of original literature kindly sent by David Prothero. 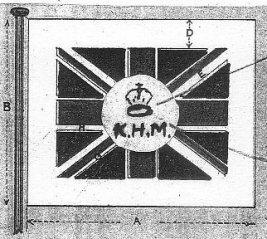 The proposal was made in a memorandum signed by P. Nelson Ward, Director of Navigation, with the design suggested being: "A white square flag with K.H.M. surmounted by a Naval Crown or Imperial crown in red", and has a sketch alongside it showing a Naval Crown. This was amended to the design ultimately adopted in a memo sent in reply by A.C. Leveson, D.O.D., which read "A Pilot Jack with K.H.M. under an Imperial (not Naval) Crown seems more suitable." "A question has arisen as to the design of the new flag for the King's Harbour Master. The flag approved was "the pilot jack with KHM under an Imperial crown in the centre", but the design approved was not the pilot jack at all. "As the general effect of the two designs, 'A' and 'B' within, is very different, the point is submitted for Their Lordships direction. Of the above sketches 'B' would appear preferable, being at once more distinctive, and it is thought more imposing than the modified pilot jack." Head of Naval Law. 4th July 1914. The rejected design "A" can be found here. It was a modification of the flag which was not only the pilot jack, but also letter "D" in the naval signal code. Christopher Southworth very cleverly spotted that the circle which surrounds the central device has a pronounced thickness to it and we could both say that this is 1/300 of the flag's overall hoist width. Flaggenbuch (1992) gives no dimensioning details for this flag and Chris very kindly put together a fine construction sheet (below). Notice too, that the style of Tudor crown here differs from the 2 mainstream styles which are to be seen throughout the British and British Colonial flags in the same publication. Flown in bows. Effective Pembroke Dock, Plymouth, Devonport, Portland, Portsmouth, Dover, Sheerness, Chatham, Rosyth, Cromarty, Queenstown, Berehaven, Bermuda, Gibraltar, Malta, Wei-hai-wei. Did not include Hong Kong (civilian Harbour Master with HM ships having exclusive rights in certain anchorages, but no control over portions so reserved), nor Simonstown (Admiralty anchor flag by custom). Order in Council under Dockyard Ports Regulations Act endowed KHM with full powers of direction and no Order in Council was necessary to assign a particular flag to that official. Flag was chosen in preference to a white square flag with K H M surmounted by naval crown all in red. Public Record Office, Kew, ADM 1/8382/172. A little more about the flag of the Queen's Harbour Master taken from 'Customs and Traditions of the Canadian Navy' by G. Arbuckle. The flag denotes the headquarters of the Queen's Harbour Master of Her Majesty's Canadian dockyards. It may be displayed continuously on a gaff or flagstaff outside or on the building housing the offices of the Queen's Harbour Master. c) Be displayed for any purpose than denoting the presence of the QHM or his deputy.